Hello, blog world! It's me again. It's been a very long time, but now I have something to say. See that picture above? And all the pictures below? Yeah, that's our son, Wesley! I am not kidding. I know what you are thinking... How? When? What the...... ? I will attempt to answer your questions quickly. Quickly- mostly because I have to go hold my boy in about 3 seconds because I haven't held him all day and it is killing me. So, on with the story. Abbreviated version. If you want more information, keep checking my blog. I'm sure I will post more details later. On April 3rd of this year, Jared's sister, who lives in Phoenix, contacted us because she knew someone who knew someone who knew someone that needed a family to take her baby. Of course, we said yes, even though we knew these things never happen. Keep in mind, we were not looking to adopt privately. We had been chilling with our little family and were enjoying being foster parents. We didn't think we would EVER adopt privately again. Anyway, the following Friday, April 6, Jenny (Jared's sister) calls me back and gives me a little info on birth mom. I call birth mom and we decide to get on the computer to Skype. It is really awkward. She says she thinks she is due in about 3 weeks. I freak out a little bit. Jared & I have strong feelings that we should go ahead with this adoption, even though it is so fast and crazy and doesn't seem like it could possibly happen. We hire a lawyer. I keep Skyping with birth mom. I'm amazed at how every thing is coming together so easily. Seems too good to be true. We find out it's a boy. We shout hooray! We pick out a name. We wait. I keep in contact with birth mom. Jenny goes to every appointment with her. We still feel good about things. We make plans for me to fly down to Phoenix so birth mom can be induced. 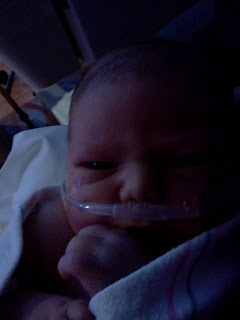 Plans change when birth mom goes into labor early Saturday morning, May 5th. I pack bags and head to Phoenix. Jared stays home to work and take care of the othe three kids. Baby is born. We name him after his great grandfather and also his daddy. We name him Wesley Jared. He is so handsome and adorable. Just look at the cuteness of this boy. I am still in Phoenix. 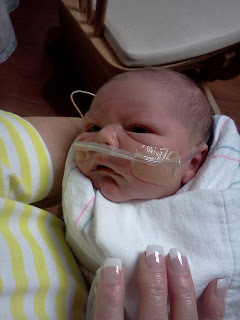 Wesley is currently in the NICU but we are hoping he will be out within the next week or so. 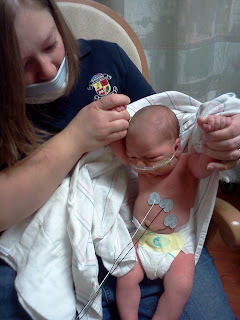 He will be fine; his little body just needs to figure out a few things before he can be released from the hospital. The good news is that we were able to sign adoption papers yesterday (Wednesday, May 9th)! That means that little Wesley is now officially our son and there's nothing can change it. It's a done deal. We are so happy! SO HAPPY! Obviously. We can't wait until Wesley is out of the hospital so that we can be together as a family. It's kind of hard being far away from each other in such a crucial and exciting and fragile time. Luckily we both have support around us. Feel free to send any prayers in our direction. Sweet little Wesley needs to get better so he can come home. Thanks for reading. Enjoy the pictures of our cute little son! CONGRATULATIONS!!!!!!!!!!!!!!!!!!!!!!! Amazing how sometimes things just WORK. He must have been excited to come join your family. Can't wait to see more pictures, and I'll add him to our prayer wall. Harmony!!!! Sweet little guy is soooooo cute! I'm tearing up...so glad he can come home to a family! What a precious little man you have! Yay! So glad to have the word out now! So excited for you guys to be home and together soon! Love you! OH.MY.GOODNESS! Sooooooo amazing! How blessed you are! Welcome to the world, Wesley Jared! I can't wait to meet you! Wonderful wonderful news! How fantastic! Congrats all around! Congrats!!!! We have been praying our socks off since we heard. 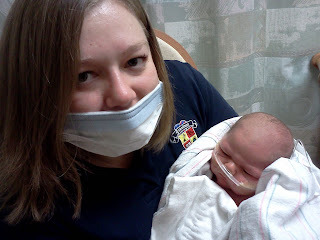 Having a Baby in the NICU is hard! But you are so blessed to be his momma. Lots of love and prayers heading your way!!! Oh my gosh! I'm beyond excited for you guys! He is such a handsome little guy. Congratulations!!! Congratulations! Congratulations! Congratulations! So exciting... I can't even believe it! Love and prayers to your family. What a crazy, awesome, amazing, fabulous AMAZING adoption! I'm so happy for you. So happy you get to have a sweet baby boy now! I hope Wesley comes home soon!! What a beautiful adoption story! I am so happy for you guys and him. It was soooo meant to be! You guys are in my prayers. I would love to help out with Megan sometime. Just let me know. So, so happy for you Harmony! What amazing news and blessings for your family. May you enjoy this sweet little one straight from Heaven. He is so lucky! So what is correct way to tell people my awesome childhood friend Harmony has a new baby boy - do I say you had a baby boy or that you adopted him? Is there a better term? Love you guys!!! Congrats! We are so excited for you guys! Congratulations! I'm so happy for you and your family!!! That is so awesome. Hope you can come home before Phoenix gets to hot :) He is adorable. Congrats!